A mountain rescue group was a revolutionary idea necessitated by an unprecedented cluster of mountaineering accidents and tragedies in the winter of 1946-1947. Volunteer mountain search and rescue groups were unheard of before this, when accidents were few and far between. Subsequent newspaper notices called for volunteers to meet and bring their ideas about search and rescue. The meeting time of the Rocky Mountain Rescue Group was set for 7:30p.m., the same time meetings have been held ever since. A steering committee was formed that consisted of Art Everson (the sheriff), Charles Hutchinson, C.A. Hutchinson Jr. Clinton Duvall, Evertt Long, Bruce Snow, Clayton Weaver (Forest Service ranger), Stuart Mace, Art McNair, and John Pederson . . . Spectacular missions dot RMR’s history from those earliest days . . . Check back here for the next installment of 70th stories: The RMR mission that gave “airplane gully” on Navajo Peak west of Boulder it’s name. 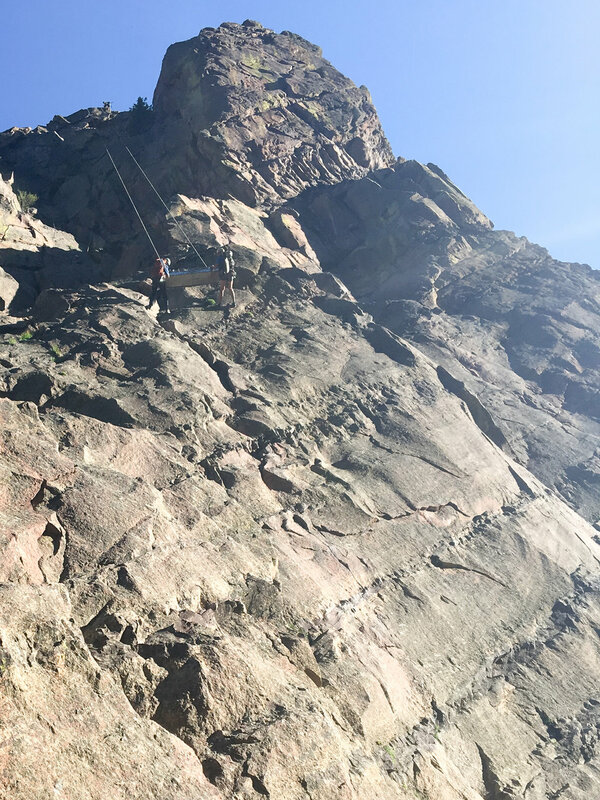 At 2:40 p.m. Friday, May 12, Boulder County Communications Center notified RMRG and partner agencies of an injured climber on the Bastille cliff formation in Eldorado Canyon State Park. Rescuers responded to the scene and deployed to the top of the cliff to prepare an evacuation. Rescuers completed a vertical evacuation down the north face of the Bastille to an ambulance on the road immediately below. The injured party was wearing a helmet which was damaged by the accident. The individual was "leading" at the time of the accident. RMRG wishes the injured party a full and speedy recovery. Looking down from the brake station at the top of the Bastille. Patient in the litter, top middle. Scree evacuation of an injured climber, March 27, 2017, Eldorado Canyon State Park. Staged on Bluebell Road, rescuers used binoculars to direct roped teams to the stuck party on the North side of the Third Flatiron. The stuck party (wearing white) and rescuers (wearing blue) as seen through a spotting scope at the Bluebell Shelter. RMRG members coordinated the rescue of a stuck scrambler who had climbed up the north side of the Third Flatiron on the morning of Monday, September 19. After finding himself in precarious, technical terrain, the scrambler began yelling for help. A bystander heard the screams, located the stuck party and called 911. Rocky Mountain Rescue Group responded to the call, sending in roped climbing teams from both above and below the scrambler. Once secured, the uninjured scrambler was lowered to the trail and hiked out to the trail-head. RMRG never charges for rescue services, and there were no fees/charges associated with this rescue. RMRG rescues many stuck scramblers in the Flatirons and would like to take this opportunity to remind people that the Flatirons are composed of many technical routes. Scrambling, with or without ropes, can be very dangerous. It is easy to unintentionally end up in difficult terrain. Always be aware of dangerous terrain (lichen, pine needles, moss, loose rock, water) on less traveled routes. When planning a climb make sure to research route descriptions, including instructions on how to return back down to the trail. Remember that climbing up is often easier than down-climbing. Only attempt to climb a features which you have researched and have the proper gear/expertise to safely complete. View of a lowering station along the South Ridge of Mount Sanitas, where the evacuation left the trail to descend west to the Mount Sanitas Valley (Fire) Road. RMRG has a record breaking year (and it's only October)! Evacuation of an injured hiker from the Chautauqua area this evening, 2015 call # 161. Arriving darkness and the tendency towards fatigue at the end of an outing increase the risk of a mis-step. Be careful out there. Apologies for impaired photo quality, but a phone image is better than nothing? "Call if you can, text if you must"
Exciting news! Boulder County Dispatch is now equipped to receive 911 requests via text message for those without enough reception to call. "Text-to-9-1-1 service is only recommended if it is the only option and making a voice call to 9-1-1 is not possible. Remember to Call If You Can, Text If You Must." See the link below for more information. RMRG helps make a movie! We assisted in making a movie: The Grand Rescue. Members of RMRG traveled to Jackson, Wyoming in 2011 to assist Swirl Productions in the filming of a documentary about the 1967 rescue of a severely injured climber off of the North Face of the Grand Teton. RMR is entering its Fall recruitment period. We have open spaces and are looking for volunteers for field members. Volunteering for RMR is a lot of work, but is uniquely rewarding. Our next Wednesday night meeting is on September 2, 2015 in Humanities 250 on CU Campus. If you're interested in the Search and Rescue volunteer lifestyle, please contact membership@rockymountainrescue.org. Keeping busy here this summer. Be careful out there. 2015 call #87, rescue of an injured hiker. Best wishes for a quick & speedy recovery. Elite ultra-distance trail runner Dave Mackey is recovering in stable condition after sustaining severe leg injuries that resulted from a fall off of a rocky ridge near the top of Bear Peak in Boulder, Colo., on the morning of May 23.